Stop and smell the Boronia… Brown variety… by Blackstone. Delightful! 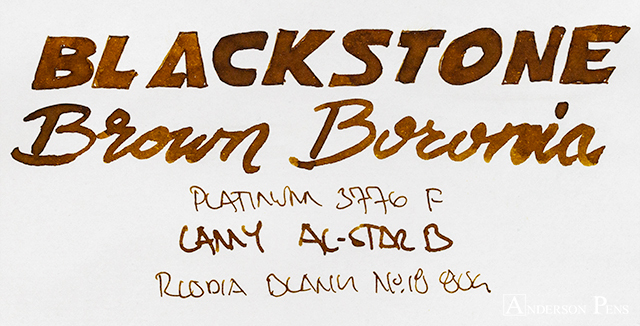 Blackstone is an Australian ink maker. 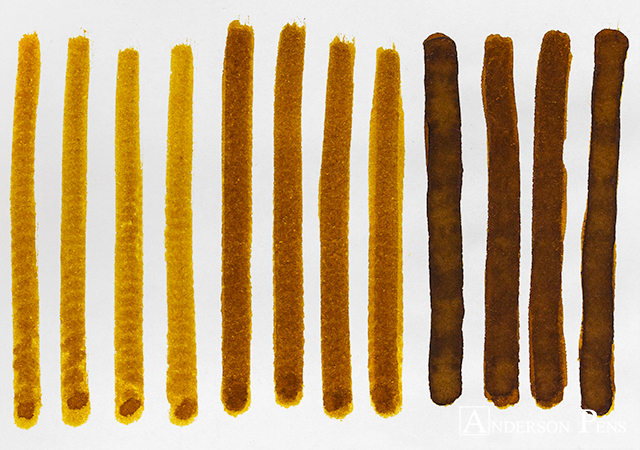 Complimenting their Colors of Australia inks, they also produce a line of inks called Scents of Australia. 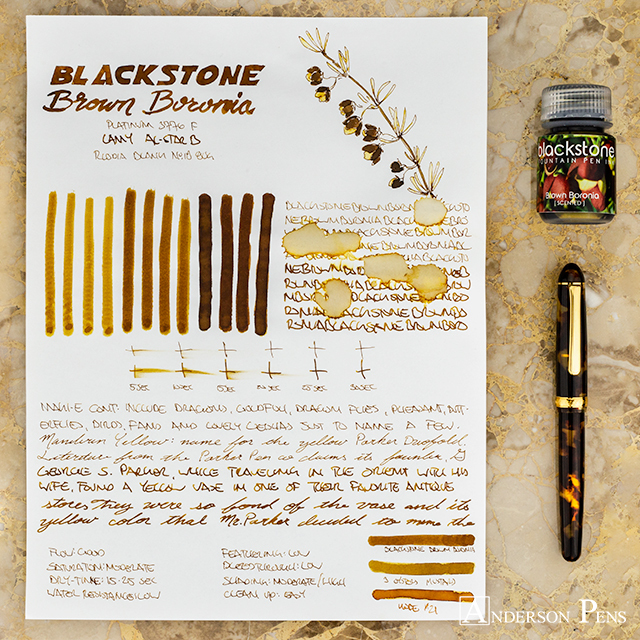 Brown Boronia is a native evergreen plant that has a “lemon scented aroma.” As for the ink, it is a beautiful golden brown color that has a pleasant citrus smell. 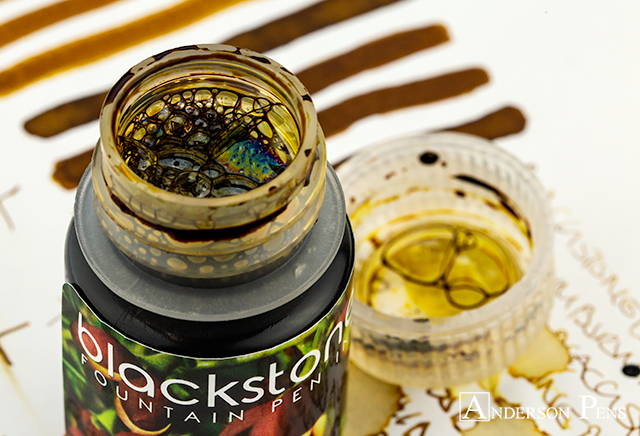 Blackstone ink comes in a 30ml plastic Nalgene bottle that is practical, and easy to fill from. 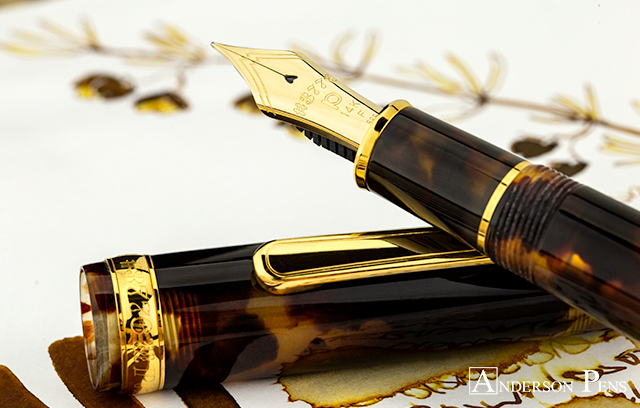 This review was done with a Platinum 3776 F, Lamy AL-Star and on Rhodia blank No.18 paper. My ability to describe scents is much worse than my ability to describe color. 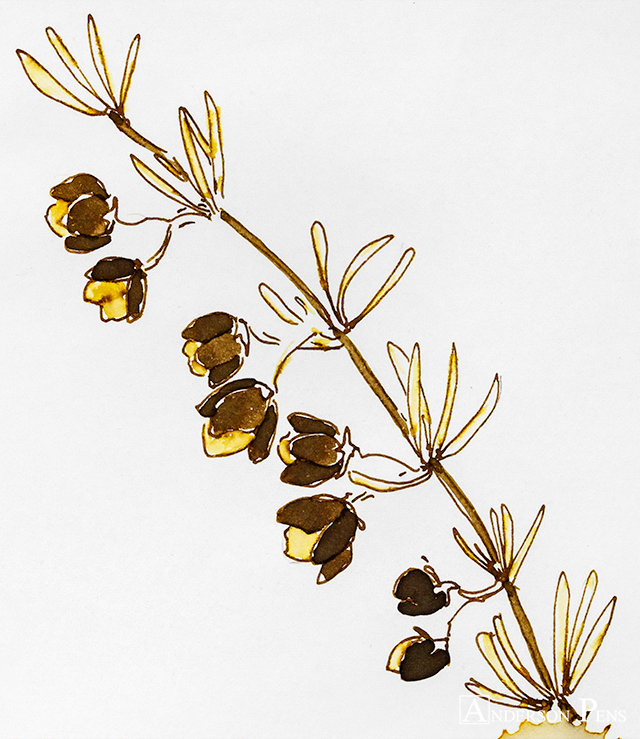 That said, Brown Boronia has a pleasant-floral-citrus scent that is detectable when you are writing with the ink. Once the ink dries, the aroma is gone. The color itself is a beautiful tawny caramel. 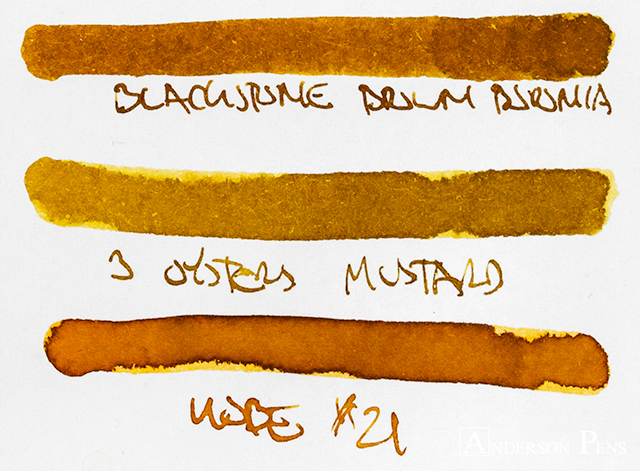 At its lightest, the ink is a mustard ochre. From there it shades to cinnamon brown before ending as a rich pecan. Brown Boronia doesn’t just smell nice, it’s also well behaved. It has good flow, with no feathering or bleedthrough on Rhodia paper. 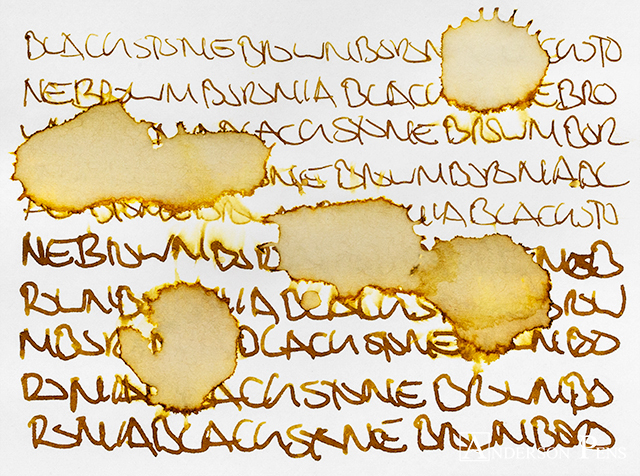 It’s a moderately saturated ink that displays some beautiful shading. It has good dry times at 15-25 seconds. The ink doesn’t have any water resistance, but cleanup was easy. If you’re the type to shun scented inks because you think they’re kitschy, please try Brown Boronia. First off, it is a killer color – it has so many yellow/brown tones that shade so beautifully together. Second, the scent is kinda nice. The smell is not overpowering, and when you go to uncap your pen you get a nice whiff. And lastly, it’s a lot cheaper to travel with you nose instead of buying a plane ticket to Australia. 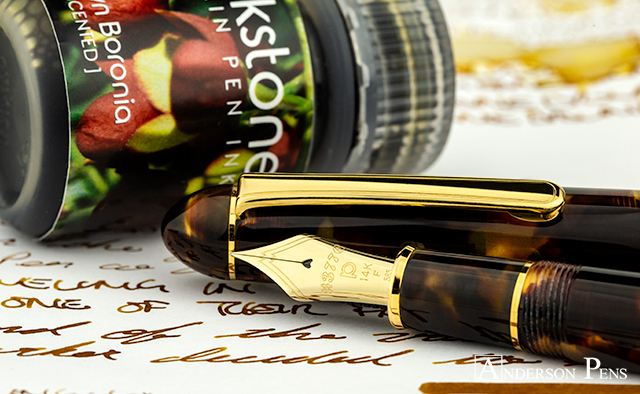 This entry was posted in Ink, Ink Reviews, thINKthursday and tagged Blackstone, ink, ink review, thINKthursday. Bookmark the permalink.